CNN President Jeff Zucker said in a new interview he didn't mind Donald Trump lying to newspapers about "The Apprentice" being the most-watched show on television, saying "that worked for us at the time." Zucker, the former head of NBC Entertainment who went on to become president of NBC Universal, signed Trump to star in the reality show competition that became a smash hit for the network beginning in 2004. Zucker told David Axelrod for his podcast "The Axe Files" that he knew even if the show hadn't been successful in the ratings, it was worth bringing on Trump because he was such a "publicity magnet." "I understood the appeal of Donald Trump in a way that I don't think anybody else did," Zucker said. "I knew for a fact that if we bought this show, even if it didn't work, Donald Trump was a publicity magnet, and that he would bring us so much free promotion and marketing in a way that we could never spend enough money to get it marketed, because I knew that he was a tabloid king, and that the New York Post and the New York Daily News would put him on the cover of those tabloids all the time." Zucker added he didn't mind Trump telling the media "The Apprentice" was the No. 1 show on television, even though it wasn't. "He would call them and say, ‘We're the No. 1 show in television.' Now, we weren't the No. 1 show in television. We were doing great, but—by the way, that worked for us at the time, because if he wants to—" Zucker said. "That's a habit that continues to this day," Axelrod said. "It does. It's obviously something that we recognize," Zucker said. Former NBC personality Billy Bush said Trump often lied to him about "The Apprentice" being the top show. Bush lost his job at NBC in 2016 when the 2005 "Access Hollywood" tape was released of Trump making crude remarks to a laughing Bush about grabbing and kissing women without their permission. Under Zucker, CNN and Trump have been frequently at odds over the three years Trump has been at the center of American political life. Zucker slammed Trump for his rhetoric about the press in October after a far-right supporter sent CNN and a host of liberal political figures explosive devices. Trump frequently attacks CNN as "fake news" and part of the media he dislikes at large as "the enemy of the people." 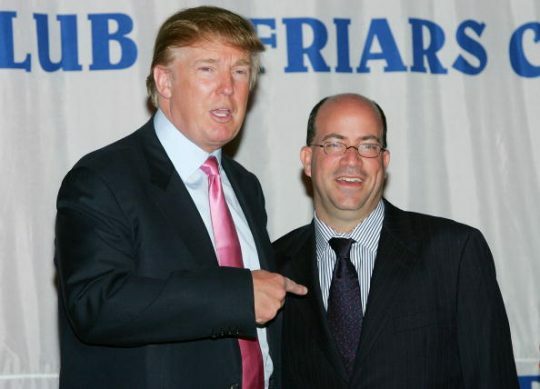 Zucker also denied a report that he wanted to broadcast Trump's wedding to Melania Trump in 2005; rather, he claimed, Trump wanted NBC to broadcast it and pay him for the rights. Zucker said NBC declined. This entry was posted in Politics and tagged CNN, David Axelrod, Jeff Zucker. Bookmark the permalink.